Singham Returns had a big drop of around 35% on Saturday from its first day. 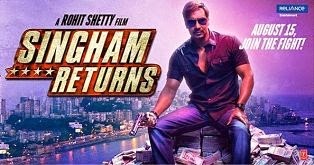 Singham Returns looks set to have 4th Highest Opening weekend of All Time after having 4th Highest Opening day of All Time. After a huge start with a National Holiday boost it was expected that the movie will have a drop. In case of Singham Returns the drop is more than what the likes of other Big movies like Dhoom 3 , Chennai Express and Kick faced. Saturday Collections of Singham Returns are around 6.5 Crore less than what Kick did on Saturday. Singham Returns is highest opening of 2014 beats Kick.